You save £24.04 that's 60% off! 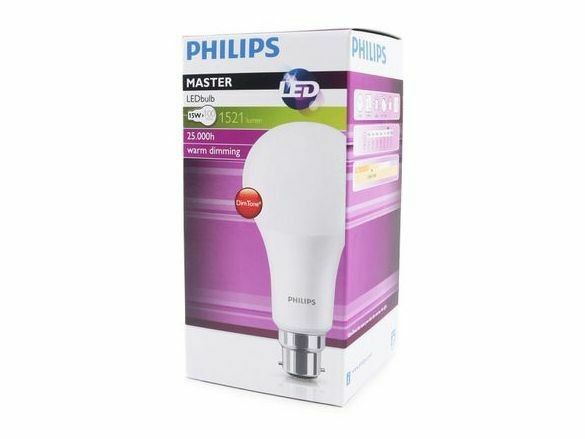 Please note that this is now the latest product from Philips and operates at only 15 Watts compares to 18 Watts. The shape is also more traditional compared to the previous design. This is one of the brightest LED bulbs currently available on the market and produces over 1500 lumens which is more than required to be equivalent to a traditional 100W bulb. It some situations this bulb may actually appear noticeably brighter than a normal 100W. The bulb is also dimmable with the majority of existing dimmer switches which is a feature of this product. As with all LED products we do recommend that a LED specific dimmer is used to achieve the optimum performance. It should also be noted that due to the unique design this has product has one of the highest beam angles available of 340 degrees creating a very uniform warm white light. We guarantee that you will not be disappointed with the performance of the product. The quality of the light is extremely high due to a colour rendering index CRI of 80. The bulb only consumes 18W which means that the bulb will soon pay for itself through lower running cost than a traditional 100W bulb. This bulb has a bayonet also known as B22 fitting. If you require the version with an E27 Edison Screw fitting please click the link. Philips have confirmed that this bulb can be used together with most leading-edge dimmers, enabling further efficiencies so a new dimmer should not be required. However in the rare circumstances that your existing dimmer switch is not compatible we recommend a LED specific dimmer.